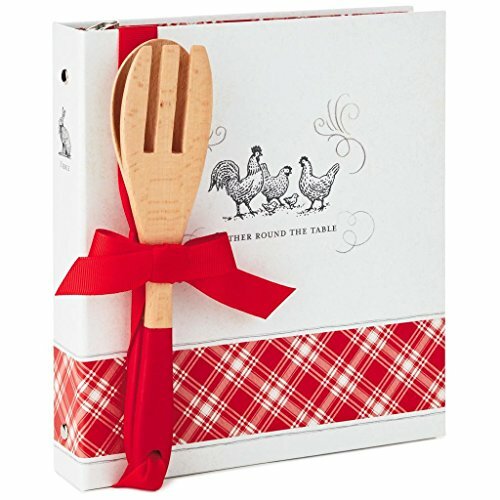 This farmhouse-chic binder with its rustic design of chickens and roosters and red plaid accents not only keeps favorite homemade recipes organized, it also comes with a pair of wooden utensils to help bring tasty treats to life. Coordinating recipe cards also available (sold separately). Combine them both for a great bridal shower present or hostess gift idea! Also coordinates with our "Served Family Style" entertaining and kitchenware. Recipe organizer book holds up to 80 4x6 recipe cards and comes with wooden spoon and fork with painted red handles tied on with a ribbon. Cover has paper grain texture. Features printed endliners. On book: Gather round the table. Includes 20 double-pocket poly-sleeve pages, 40 4x6 designed recipe cards, 1 top-loading pocket page, 10 printed design tab dividers and 5 pages of cooking references.